Ok, I know, I am jumping the gun in a huge way. Most of us are locked in the grip of winter and struggling through snow and freezing temperatures. So I felt a pop of spring was a necessity to cheer me and everyone else up. I really stretched the sketch this week. But it was fun to see the branches work as the grey strips on the sketch. 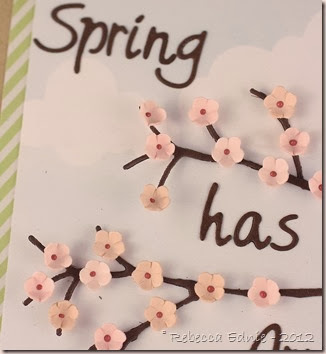 Ok, so I know the ‘Spring’ looks crooked but I SWEAR it isn’t! I measured it twice! I think it’s the slant of the ‘r’, then the fact that the top line of the ‘n’ is low and the bottom of it dips down combined with ‘g’ tail dipping down too. The centers of the flowers are made with a tiny dot of Viva paper pen. 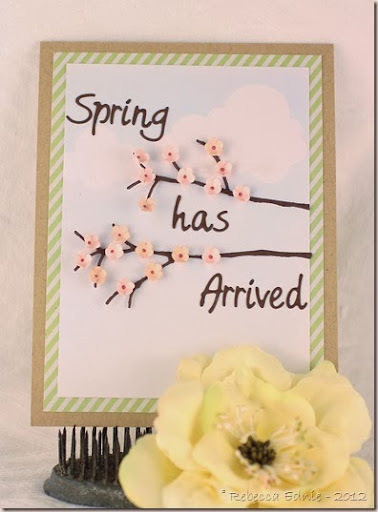 The branches are held with glue only at the thicker part of the branch so the thinner parts with the flowers sit off the paper a bit giving the, dimension. I cut some small bits off the upper branch and moved one smaller branch and relocated it to make it look different from the bottom branch so more realistic. I’d love to see what you would do with this sketch? Do you play it clean and simple? Jazz it up? Stick right to the sketch? or go outside the box? 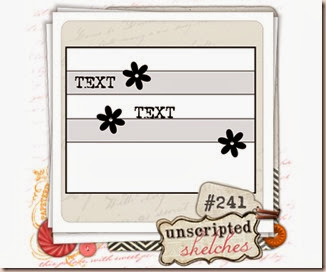 Please be sure to join us at Unscripted Sketches this week! Thanks so much to all of you who come back and play often or even every week!